I’ll make a deal with you, dear reader; I’ll only directly mention present political events when they have a direct bearing on the themes of el bloggo – Druid Magic and Pagan Occultism. Folks can see more of my political thoughts on Facebook, should they have that taste. The single scariest thing I've heard our new president say (yet) is the assertion that American patriotic unity should derive from the belief in a Creator God, and that religion could unify the nation. In his inaugural address he painted a picture of unity based on “The same Creator God” across the continent. The president, never before a man of any noticeable spiritual inclination, seems willing to allow his office to become the platform for the theocratic visions of the worst elements of modern Christianity – Dominionists and Christian Reconstructionists. I object to this on both political and philosophical levels. Politically, giving churches and the modern interpreters of ancient scriptures political and social power has been a reliable formula for oppression. In the US we seek a society based on liberty, and limiting liberty according to the imagined ‘laws’ of one sect or another is not the path to growth and prosperity. Rather, I think that the goals of American liberty are served when every neighbor is free to worship the gods or God or whatever as they see fit. When we make unity around the common welfare, not around a common mythology; I value feeding my neighbor far more highly than I value worshipping with my neighbor. I would make it the government’s business (not the church’s, incidentally) to see that all our people are fed, and not it’s business to see that all our people worship together, or worship the same thing, or being, or whatever. Philosophically I am highly suspicious that monotheism itself is a toxic idea. To take this to first principles, I think that because I think that monotheism is simply false. There is no one creator being, no being that rules the spiritual cosmos and decides the fate of souls. The gods and spirits live in the same Great Dance as we do, and existence proceeds from all of our actions. That is to say, I am a polytheist and animist on a mythic level – divinity is best expressed as multiple persons. So, in order to make monotheism even vaguely rational one must compose a vast web of new rules, imposed boundaries and leaps of faith. Here, read this little jest, about the blind men and the beasts. As various locations and peoples try to express this One God, they inevitably create their own local version of it (that’s how religion actually works). Since monotheism usually comes with a strong “us-v-them” component, the differences between my One God and yours must be reconciled, often based on which faction holds political authority at the time. Warfare based on religion was not unheard-of among polytheist peoples, but almost so. Polytheists expected their neighbors to have different but recognizable religions, and often left one another’s ways alone, even in victory. Gods of other peoples were not ‘false’, and nobody wanted a strange god’s ill-will. But the monotheists redefined all the spirits of the polytheistic world as ‘devils’, and almost immediately took up crusade against them. When competing monotheist ideas arose, those were treated as equally ‘Satanic’. Perhaps I ramble. 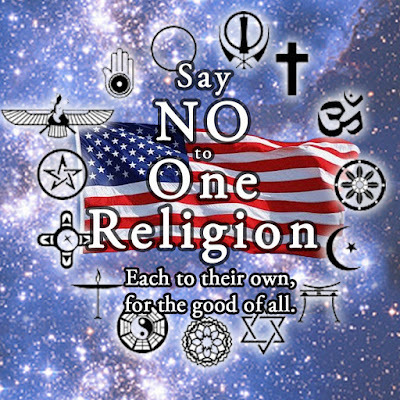 My assertion is that any attempt to unite a diverse group of people under one religion must amount to dire oppression. There is no Great Truth that will just make all the Jews and Bahais and Voodooists and witches and Baptists and Johannites and all to just say “Oh… yeah, that seems right”. The inevitable historic path to monotheistic unity has been the burning of temples and books. So, if the government, or the society, comes to me and demands that I take up the new state cult… we’ll see. I’m a polytheist – as long as I can keep my gods, I always have room for another, I suppose. That hasn’t been how such things have usually gone.